“The further the spiritual evolution of mankind advances, the more certain it seems to me that the path to genuine religiosity does not lie through the fear of life, and the fear of death, and blind faith, but through striving after rational knowledge.” Albert Einstein, it seems may have been a huge inspiration to the people of Black Rock City at this year’s Burning Man festival. 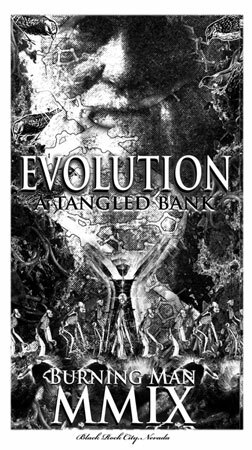 Almost a continuation from 2007’s ‘Green Man’ theme, 2009’s ‘Evolution’ theme philosophized about and demonstrated how we got to where we are, why we find ourselves in this state of ‘eco mania’ and what its part is in the overall evolution of man and our consciousness. If that sounds a bit full on, let me tell you, my mind is still boggling at some of the speakers and surrounding discussions. The vast array of sub topics surrounding this main topic of evolution is phenomenal, especially because it is so intrinsically connected with the age of environmentalism we find ourselves in today. There were plenty of ideas to take away from this year’s festival. Education is the key to our evolution that is for sure; something I picked up on the plane ride leaving London in an article in The Times titled “Evolution is fact. End of story”. The journalist had interviewed Richard Dawkins, author of The God Delusion and The Greatest Show on Earth who discusses what is needed from each of us to evolve: ‘many people just don’t know what the facts are. They are simply uneducated. And that’s a fault of us as scientists for not going out there and communicating with them.” Given ‘40% of American believe that the world is less than 6,000 years old (according to Dawkins) its forums like Burning Man that can make this information accessible to the wider ‘uneducated’ world… I include myself in this as there is so much in the studied area of evolution (mind, body and spirit) that I’m yet to discover.